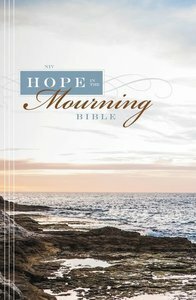 About "NIV Hope in the Mourning Bible"
Timothy J. Beals is President and Chief Solutions Officer of Credo Communications. He has served in strategic leadership positions with some of the world's best companies and organizations, including the leading Christian publisher, Zondervan, and the world's largest Christian nonprofit organization, World Vision. Tim works with an international team of dedicated communications experts--authors, editors, agents, translators, publishers, designers, and printers--to meet the needs of our clients worldwide. He has authored Teach Us to Pray: 365 Prayers from the Bible, The Red Letters: The Sayings and Teachings of Jesus and The Essential Engstrom.